Sunbelt Bakery kicks off the New Year by introducing a new Peanut Butter Chocolate Chip flavor that combines the saltiness of peanut butter with the rich sweetness of chocolate chips to make a delicious snack with only 130 calories per serving. “Sunbelt Bakery believes a balanced diet does not necessarily mean people have to sacrifice taste in the snacks and foods they eat every day,” said Jeff Badger, brand manager for Sunbelt Bakery. Sunbelt® Bakery, maker of delicious granola snacks that have a bakery-fresh taste with no preservatives, announced today the company will kick off the New Year by expanding its line of chewy granola bars to include a new Peanut Butter Chocolate Chip flavor. This new chewy granola bar combines two classic flavors – the saltiness of peanut butter and the rich sweetness of chocolate chips – into one delightful snack option that consumers can enjoy and eat anytime, anywhere while still keeping the needs of their balanced diet in consideration. Like all other granola snacks from Sunbelt Bakery, the Peanut Butter Chocolate Chip Chewy Granola Bars are made from whole grains and high-quality ingredients. In addition, the new bars contain no preservatives or high fructose corn syrup. Every week, Sunbelt Bakery makes new batches of granola bars in its family-owned bakery right here in the U.S.A. and delivers them to communities across the country. This commitment ensures consumers will always experience a delicious, bakery-fresh taste in every bite of a Sunbelt Bakery product. The Peanut Butter Chocolate Chip Chewy Granola Bars will become available at retailers nationwide in late January or early February 2014. The new chewy granola bars, which have six grams of whole grains and only 130 calories per serving, will be available in a Family Pack box that contains 10 bars and has a suggested retail price (SRP) of $2.69. To learn more about Sunbelt Bakery and its wide variety of bakery-fresh, no preservative snacks that consumers can feel good about enjoying, visit http://www.SunbeltBakery.com or find Sunbelt Bakery on one of its social media pages at http://www.facebook.com/SunbeltBakery or https://twitter.com/SunbeltBakery. McKee Foods, a family-owned company based in Collegedale, Tenn., introduced the Sunbelt brand in 1982. The Sunbelt Bakery brand includes cereal and snack products, including chewy granola bars, fruit and grain cereal bars, and cereals. 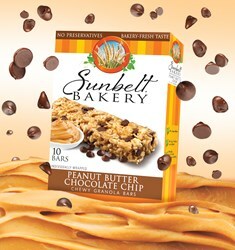 To learn more about Sunbelt Bakery snacks and cereals, visit http://www.sunbeltbakery.com.